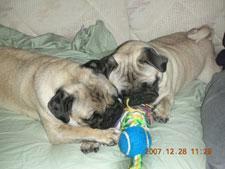 We adopted Luna, a two-year-old fawn pug, from CPR on November 14, 2007 as a playmate for our 1 1/2 year old, one-eyed rescue pug, Izzy. We were warned that Luna is a challenge, but we could not have imagined that such a beautiful little girl could cause so much trouble. We are still working on issues; we even hired a private trainer. Despite the problems, when Luna is tired from a day of wreaking havoc and snuggles up with us, gives kisses and makes a cheesy face, we know she is here to stay. Luna has joined us for two long vacations on our 56-acre farm in north Georgia. At home in Florida, she gets frequent walks, trips to the dog park and car rides. Not to mention her twice per day meals of premium dog food with fresh toppings of lean ground beef, turkey, chicken or steak. Luna loves to snuggle, play and sleep with her sister Izzy every day. And we still have hope that she will mellow with age. We know that Luna has found her forever home, and we could not imagine our pack without her.